Lochsa Falls - Photo Mike Wooten / Paddler Todd Hoffman. There is a gage painted on the downstream, river-right piling of the bridge at Lowell. When you hear people refer to feet readings for the Lochsa this is gage they are refering to. DO NOT confuse this with feet or stage reading from the USGS online gage. The two do not correlate. The Lochsa starts getting big at about 6' on the bridge at Lowell. As flows increase it just keeps getting bigger. Peak flows are around May 31. In big snow years there is high water till the end of June (in 2008 I ran it at 8' the third week of June), but most years levels will have dropped out by the second week of June. 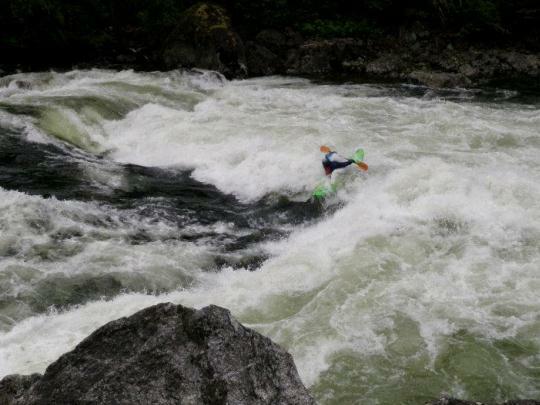 Medium level flows, below five feet at Lowell, are still very fun, but its not the classic Lochsa Big Water experience. Extremely low flows runs are possible, although with a completely different character. 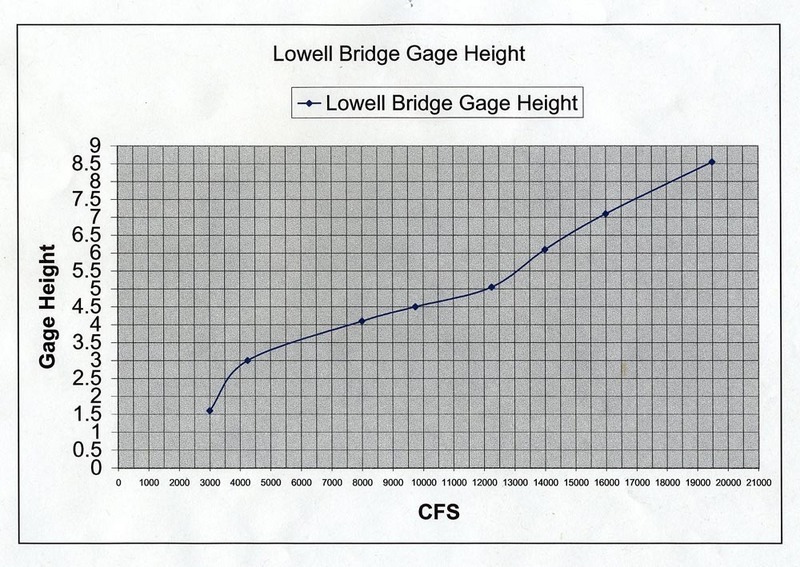 See the below link to convert cfs readings from the USGS gages to stage readings on the bridge at Lowell. The Lochsa is an Idaho classic big water run. From Fish Creek to Split Creek is the most commonly run section. The upper section is a notch higher in difficulty, especially at high flows. Most of the rapids are straight forward, but its a good idea to scout before hand to familiarize yourself with the lines. There is undeveloped camping along the upper Lochsa, but things get busy on peak weekends, especially over Memorial Day, which corresponds to peak flows. For developed camping, Wilderness Gateway, located just upstream from the Fish Creek put in, is the most popular spot with boaters. Advanced reservations are advised for peak weekends. Just across the bridge from Wilderness Gateway, is the "Wildernes Ghetto", which serves as a sort of overflow spot. It is particularly popular with boaters who find the rules at Wilderness Gateway too confining. Below the Split Creek take out is Apgar Campground, which is very nice, but less convenient for river runners. Rustic cabins are available for rent 15 miles below the Split Creek take out at the "town" of Lowell at the Three Rivers Resort. At Lowell there is a small store (convenience items only), gas (bring your wallet), a couple of restaurants and a bar. The Wilderness Cafe serves a good hot breakfast, which hits the spot on cold Lochsa mornings. Commercial rafting trips operate out of Three Rivers so thingscan fill up quickly there during peak season and advanced reservations are highly recommended. For luxury accomodations, head seven miles further down river to the River Dance Lodge. River Dance has beautiful hand crafted log cabins with private hot tubs. There is also an excellent upscale restaurant here, the Syringa Cafe. ROW adventures operates rafting trips from River Dance, so things can also fill up at peak times. Advanced reservations are highly recommended. Meriwether Lewis, Thomas Jefferson, and the Opening of the American West. Simon & Schuster, 1997. The Journals of Lewis and Clark. and the Opening of the Northwest. Mariner Books, 1997. Land Ethics in the Bitterroot Mountains. Mountain Press Publishing Company, 1996.